I love gift guides. Usually I only read them because I love finding stuff for myself, is that wrong? I feel like I have a very specific interest (those of a witchy nature) so most gift guides for moms or women in general just don’t do it for me. Plus whenever family members ask me what I want, I usually tell them I’d prefer money if they insist since I know for a fact they’re not going to know what the heck I want. 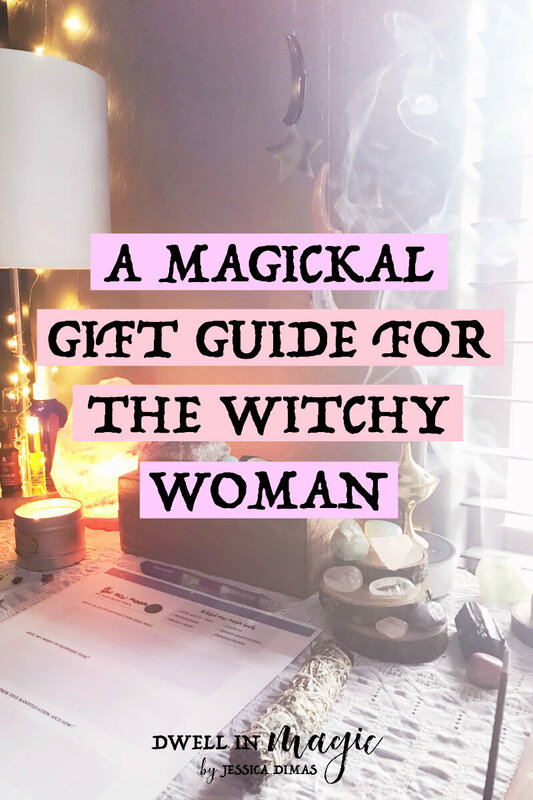 So I’m creating a gift guide for us witchy women, full of mystical, spiritual, grounding, healing things. For either yourself or to gift to a witchy someone in your life. And if you have any suggestions for things to add to this list, feel free to contact me or leave me a comment below. Oracle and tarot cards are very personal so if you’re buying them for someone else, definitely keep their interests in mind and if you don’t know where to start, try to let yourself be guided to a deck without questioning your intuition. That’s our spirit guides telling you exactly which deck we need! 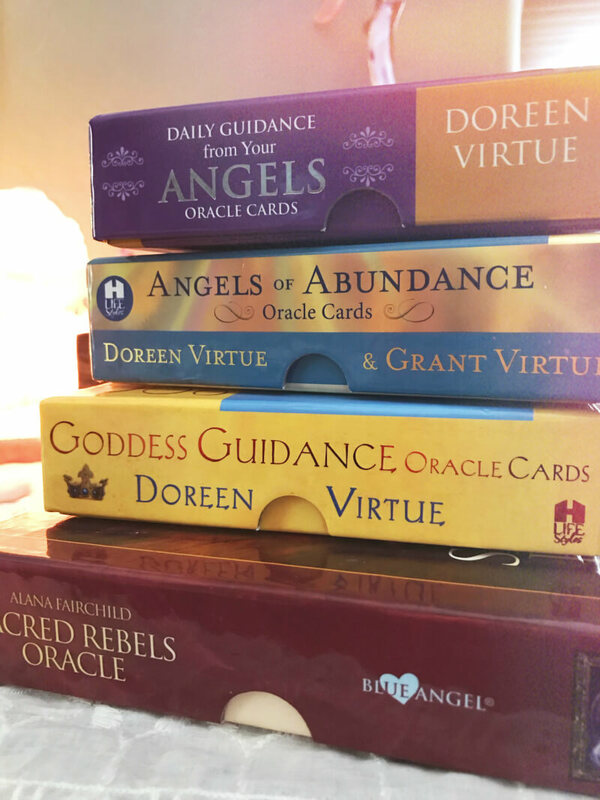 A few favorites of mine are Sacred Rebels and Goddess Guidance. I use these frequently for everything from in-depth guidance to a daily card pull. Daily Guidance from your Angels is the most popular deck on Amazon and I have this one as well; it’s my favorite for a daily card pull and the accuracy is frequently mind-blowing. I don’t have tarot cards, but some well-loved decks are The Wild Unknown and the classic Rider Tarot deck. 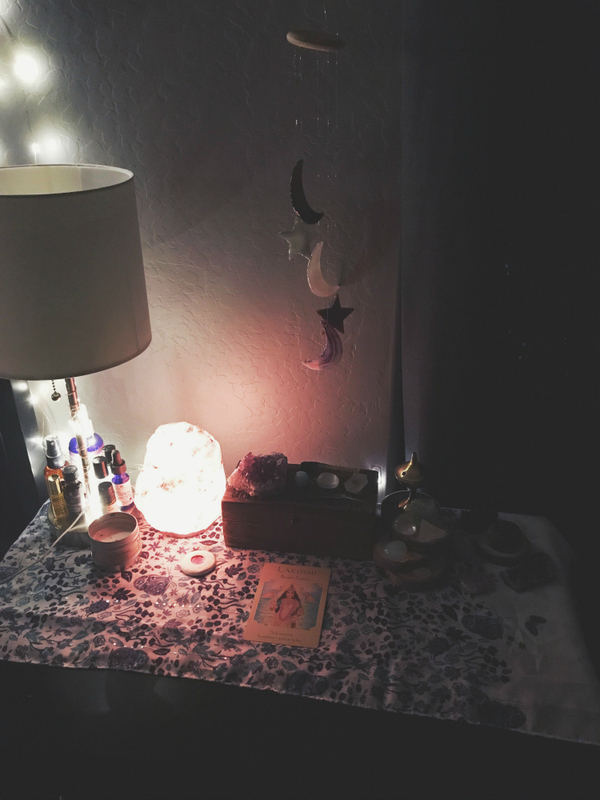 You can NOT go wrong if you give a witchy woman something that will create soft lighting. Candles, string lights, and salt lamps are life. I personally have a salt lamp that I use every single night, these LED string lights that I keep in my sacred space as well as in my living room for a really soft ambiance, and candles of any kind are awesome, but something like this would really excite me because it has herbs and essential oils in it (excitedly clapping right now). 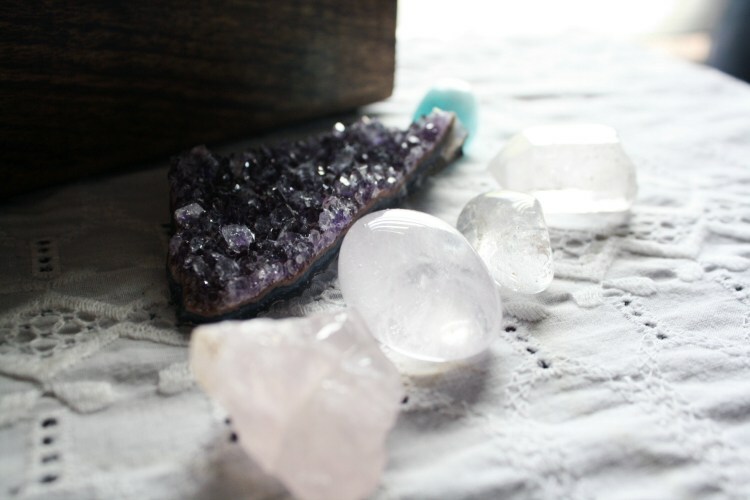 Another item you cannot go wrong with – crystals! We use them for so many things, mostly for balancing and healing ourselves as well as connecting with the Divine. Like with the oracle/tarot cards, try to let yourself be guided to which crystals you pick out for her without questioning yourself. This crystal set is beautiful perfection; it has my favorites (amethyst, rose quartz and clear quartz) plus a stone for each chakra and a pendulum. 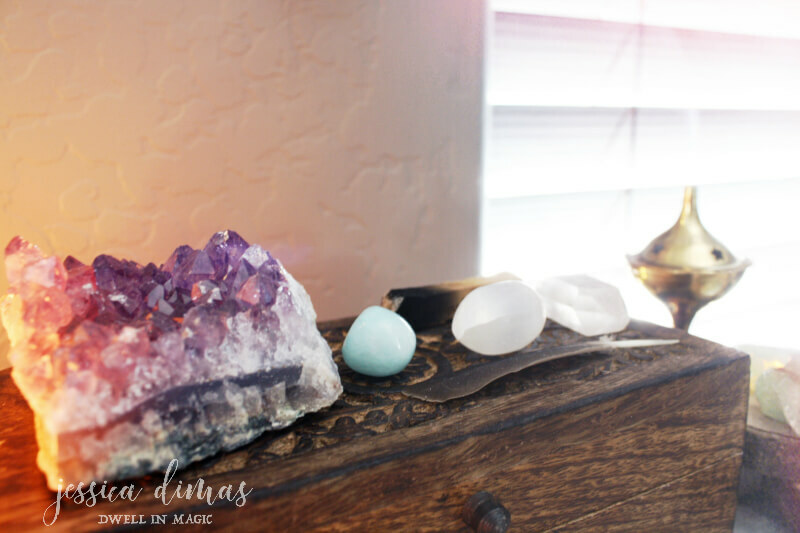 Like my photo above shows, a beautiful etched wooden box is a place where we can keep crystals, card decks, momentos, and also to display special items on top of it like I do with my crystals. It’s also handy when I want to take all of my crystals outside for a moon bath and I can fit all of them in there nicely. 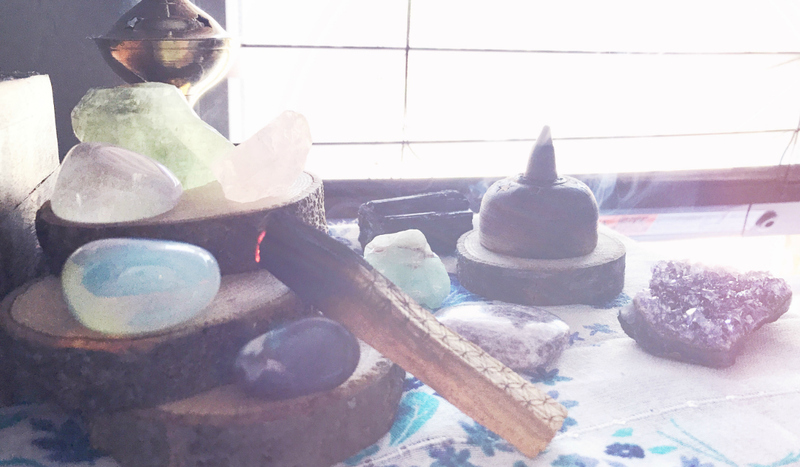 Like most people are usually always happy with a coffee gift card or socks, witchy women are always happy with some sage or palo santo. We can never have enough and we use it constantly. It’s a way for us to energetically clear our spaces, home, ourselves and everyone else in the house whether they are aware of it or not! Witchy women love to banish and clear negativity away, and one way to do that is by using a floor wash that will remove stagnant or lingering negative energy in her home. 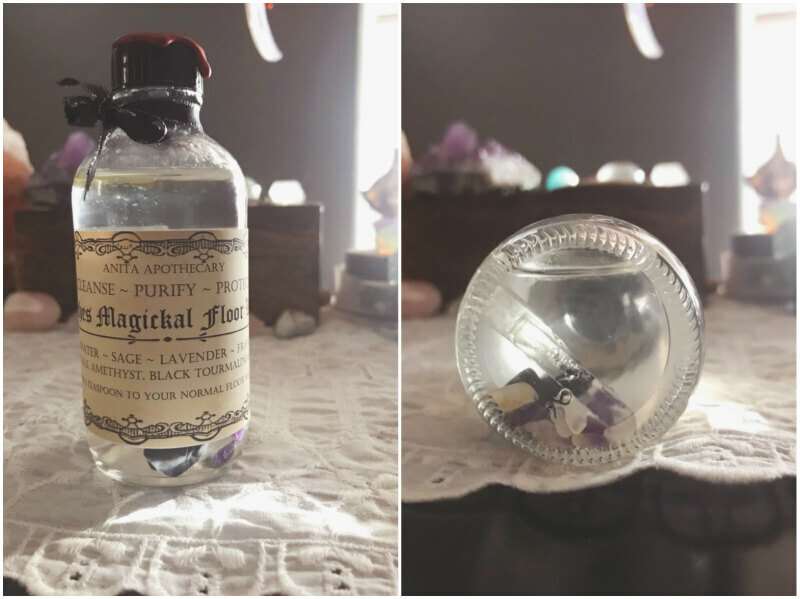 I found this Witches Magickal Floor Wash in a beautiful Etsy store and I absolutely love it. It smells so clean and has crystal and essential oils added in for not only cleansing but for clearing and protective properties as well. It’s a small bottle but you only use a tiny bit in your bucket and it goes a long way. I loooove oils and sprays infused with essential oils. 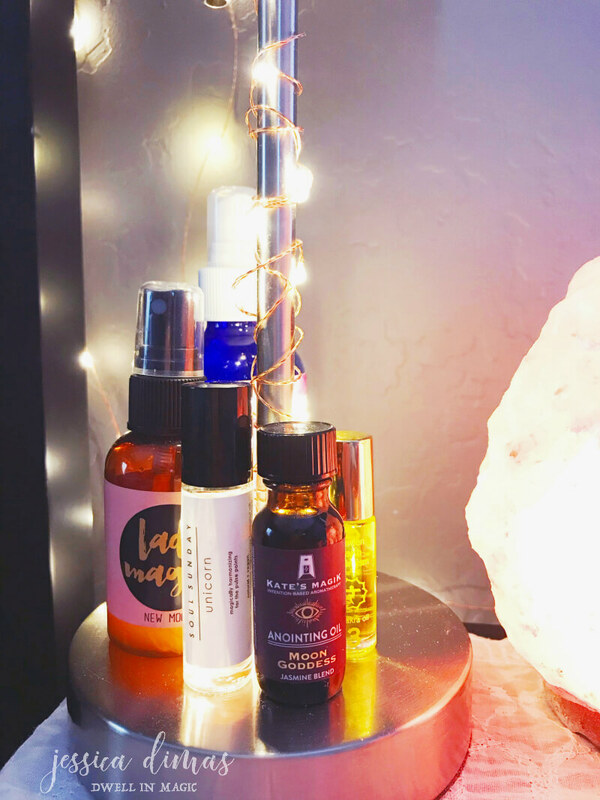 Not only do they ground and destress me, but many oils carry spiritual properties and help you connect with the Divine. I use my favorite anointing oil during moon rituals or anytime I’m connecting with the Divine or my spirit guides. I dab it on my pulse points, my third eye, crystals, oracle cards, etc. Basically anything I want to clear and open up to Divine guidance. And since most witchy women follow the moon, this moon anointing oil is perfect. Speaking of the moon, this 20-page set of worksheets and ritual guidance is close to being my bible. It contains a ritual for every week of the month following the moon so that you can plan, take inspired action, manifest, and reflect. To complete this gift, I would recommend a beautiful binder like this one and pretty dividers like these. 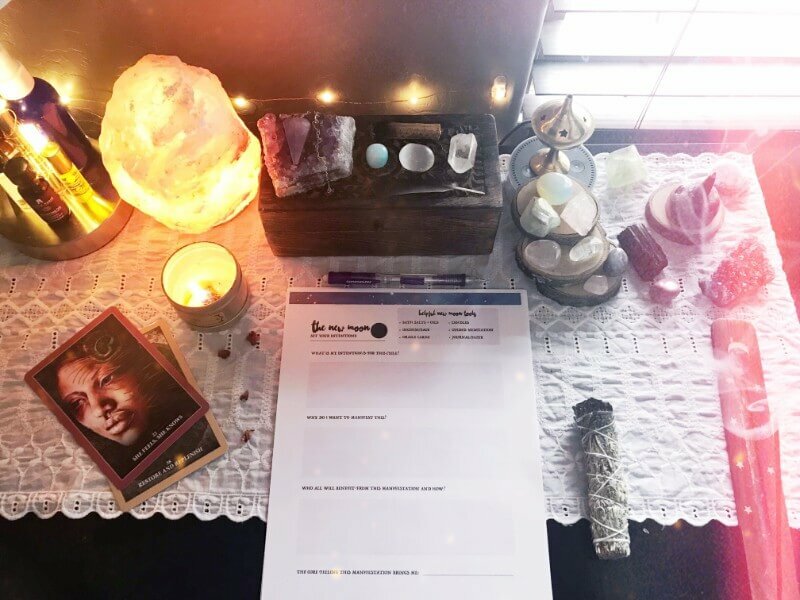 Yes I did create it so I guess this is a shameless plug, but I’m very confident in recommending it as I use it every week to connect with the Divine as well as manifest my intentions. I consider it one of the most magickal products I’ve created. A grimoire is a place to record everything pertaining to a witch’s craft; spells she’s created, crystals and their meanings, herbs, oils, rituals, dreams, and/or anything that represents her. It can be anything that has pages in it. 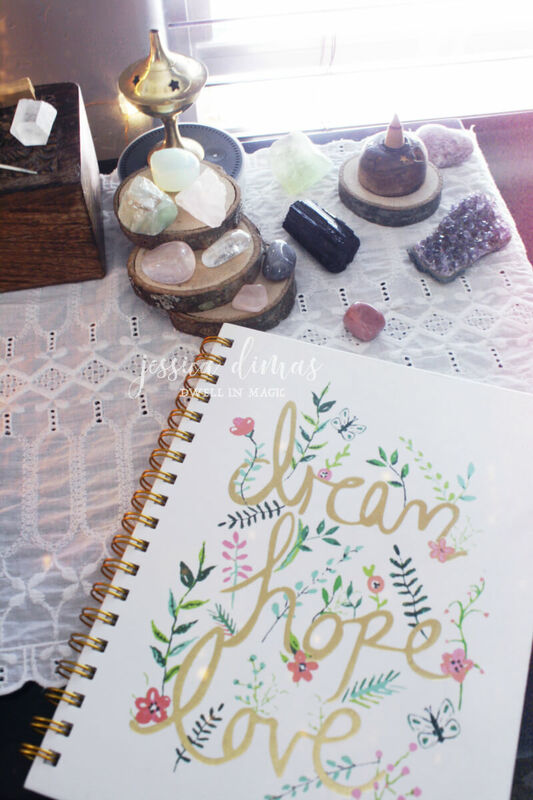 I think this is a beautiful journal that could be used as a grimoire. I personally have yet to start a grimoire as they’re super close to being crafty and I’m anti-craft making. I can’t stand crafts. But I do love journaling and writing so when I do begin my grimoire, it will definitely be more writing and less artsy. It’s a rare woman, much less a witchy woman, who wouldn’t like receiving some type of bath salts. Epsom and pink Himalayan salts are full of minerals that detox the body and clear your body’s energetic field of negativity you’ve picked up throughout the day/week/month. 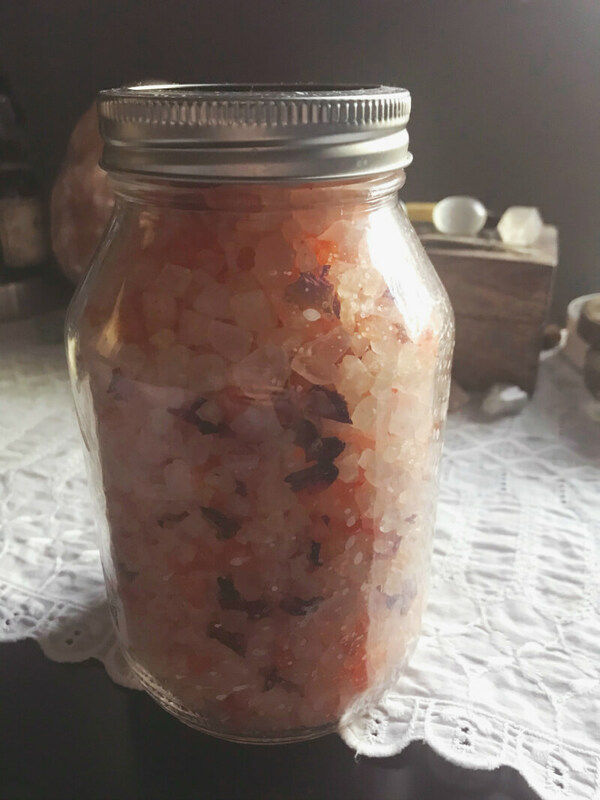 I always keep a huge bag of epsom salt under my sink for most of my baths, and I always have some pink Himalayan salts that are infused with essential oils and have rose petals in them (which I usually find in the bath section of Home Goods). I put one cup and a half of epsom salt and half a cup of the Himalayan bath salts. So that completes my Magickal Gift Guide for the Witchy Woman. I hope it gave you some good ideas. If you’re a witchy woman, tell us in the comments below what you’d love to receive, I’m sure it will help out those who are here for ideas. Thanks for reading and be sure to follow me over on Instagram for more magickal inspiration. These are wonderful gift ideas. I love crystals as my little obsession with them started earlier this year. I love love love soft lighting myself too! I have a Himalayan salt lamp beside my bed that I keep on as long as I am in the room. Epsom salt baths are my jam too, I try to do them every few weeks to rid the negative. I’m glad you agree!! Yeah I rarely think of the salt lamp as one of my favorite items but it gets used more than probably everything else!